Tungsten plate is mainly used to make temperature standard light source, tungsten evaporation boat, electron tube shed, heat shield, high temperature furnace components, X-ray tube tungsten target, etc. Satisfactory results have been obtained in these fields. With the continuous development of science and technology, the application of tungsten plate has been expanding, especially in nuclear energy, medical devices and other fields. But in general, tungsten is a kind of material with high brittleness at low temperature. The strength and hardness of tungsten plate prepared by common method are insufficient (270MPa tensile strength at 1000 ~C) and 380 hardness (HV30). It has poor machinability, easy edge collapse and cracking, low yield, and difficult to meet the performance requirements of tungsten plate used under harsh conditions such as nuclear energy and medical equipment. (2)The forged tungsten plate is subjected to heating and rolling, the first fire rolling heating temperature is 1200 °C -13 50 °C, the processing rate is 20% - 30%; then at 1100 °C - 1250 °C temperature, tempering 10 -30 minutes, and then rolling, the processing rate is 15% ‐ 25%; follow-up rolling is carried out according to each fire reduction of 50 °C -200 °C, the processing rate is 10% ‐ 25%, until the required size is reached. (3) Stress relief annealing of the rolled tungsten plate is carried out in hydrogen furnace at 1000 1300 according to the final rolling temperature and the size of the rolled tungsten plate. The annealing time is 10 120 minutes. By combining forging with rolling process and controlling cooling forging or rolling deformation sequentially, the large deformation of tungsten plate can be processed plastically, and the grain structure of the metal can be refined sufficiently. There are no defects such as voids and cracks among the grains. 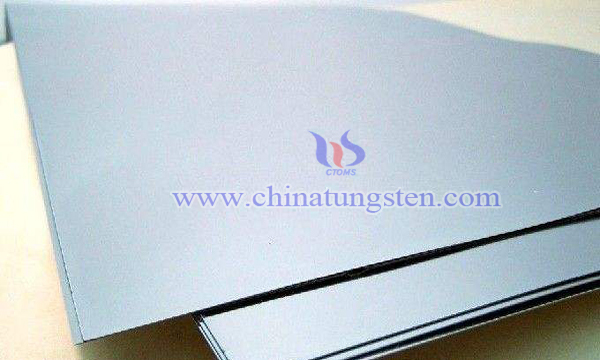 After stress relief annealing, tungsten plate has good mechanical properties, hardness HV30 (> 410) and B (> 350 MPa) at 1000 C. The cutting performance has been significantly improved, which can meet the stringent requirements in the fields of nuclear energy, medical devices and ion implantation.